Ollie Velna Hinshaw1,2,3,4 [Allie V. Hinshaw5, Allie Wilda Hinshaw6]. ZEPHYRHILLS, Fla. -- Robert N. (Bob) Watkins passed away at his home Thursday, February 7, 2008, at 10:20 p.m. He was a veteran of WWII. He served with the 90th Infantry 358th Regiment. He is survived by his daughter, Joyce Ann Watkins Duser (Art); one sister, Alice Faye Piper Rich (James); and one brother, James Lloyd Piper (Linda). A memorial will be held Tuesday, February 12, 2008, at Whitfield Funeral Home in Zephyrhills, Fla. at 1:30 p.m.
Information furnished locally by Rich and Thompson Funeral and Cremation Service in Burlington. Contribution from Joyce Watkins Duser. "Missouri Newspaper Death Index", Ancestry Inc., 1997, Orem UT. (www.ancestry.com). 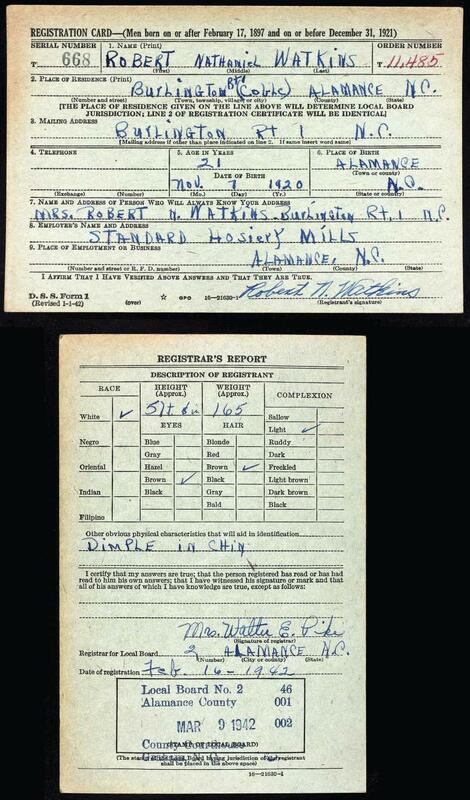 U.S. WWII Draft Cards Young Men, 1898-1929; http://www.ancestry.com. Florida Divorce Index, 1927-2001; http://www.ancestry.com.